By Meredith Chilson on July 19, 2013 Visit Meredith's Website. We have a chicken that seems to wait too long before heading to the nest boxes. 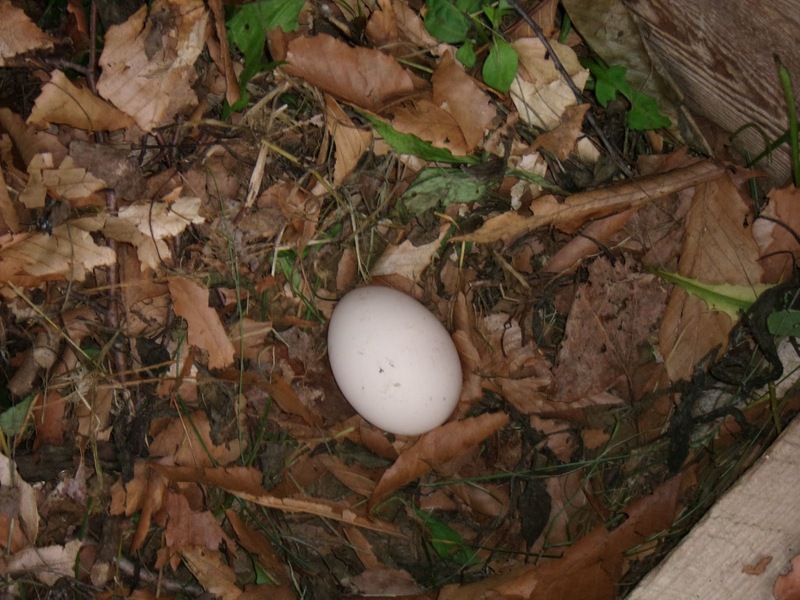 About once a week, I find an egg that’s rolled into a corner of the hen yard, or under a branch, or even in the middle of the coop floor. I’m never quite sure how fresh those eggs are—and I was thinking that this would be a good time to review the way to tell if eggs are fresh. It’s a particularly good time, I think, because I’ve been hearing about lots of hens that are going broody—finding corners and hidden spots to make nests and fill them with eggs. I don’t have a rooster, so those eggs aren’t fertile, and it doesn’t seem to take long on these hot days, for eggs to become less than fresh. I don’t like cracking one open and finding that it’s way past good. · Fill a clear glass with cold water. 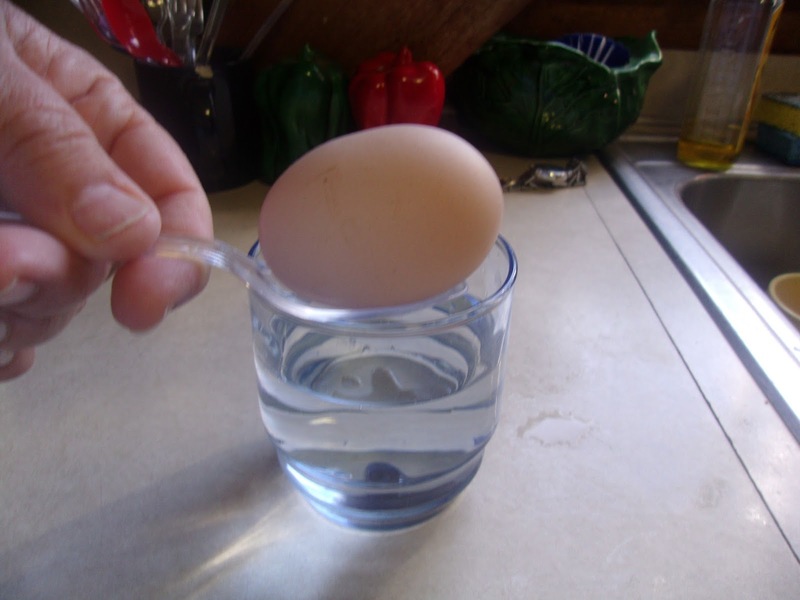 · Lower your egg into the water with a spoon. · If the egg floats—discard it. · If the egg stays at the bottom—it’s fresh. As you know, eggshells are actually slightly porous. When eggs are freshly laid they are covered with a coating called the “bloom” that seals the pores and keeps bacteria out of the egg. (See my other post.) Washing or handling removes the bloom and air will begin to gradually enter the egg. When an egg is laid, an air cell (or pocket) is present, along with the yolk and albumin. As the egg ages, air enters the egg, the air cell becomes larger. At the same time, gases from the changes beginning inside the eggshell are being released. The egg begins to weigh less. 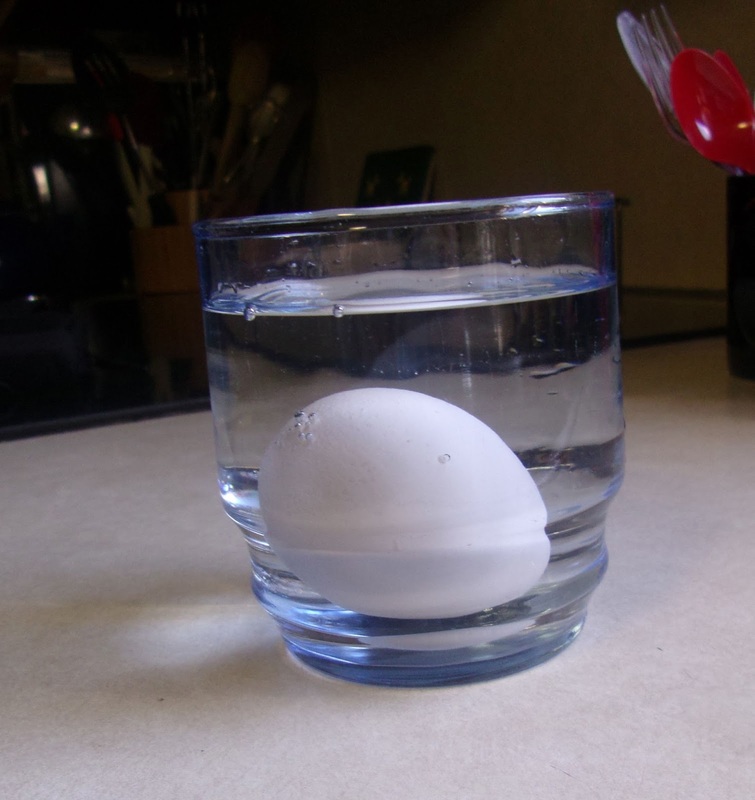 As the internal contents decompose, more gases are released and the egg will float in the water. 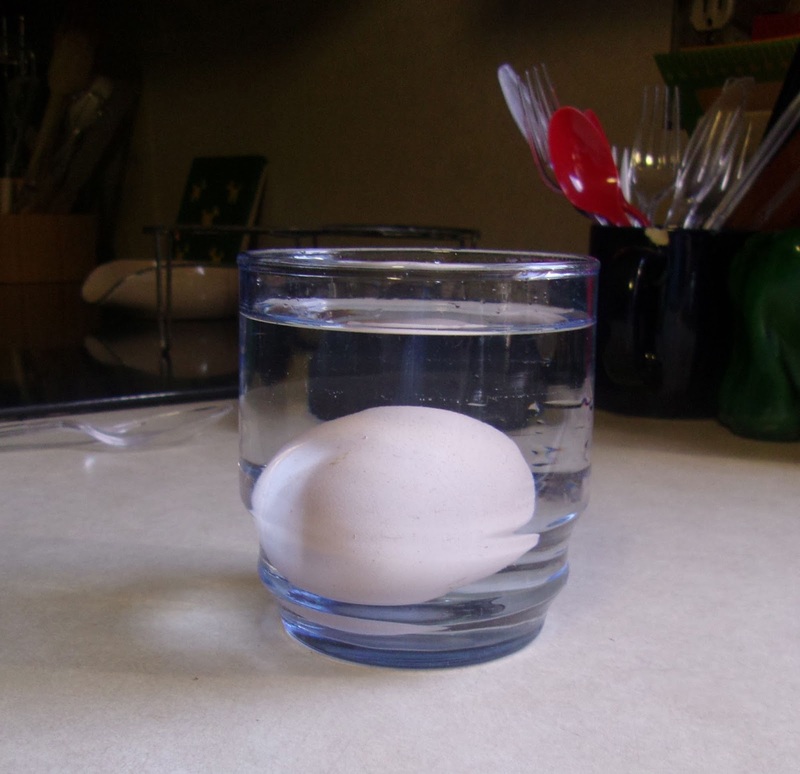 Usually, as the eggs age, the egg in water will tilt so that the large end is up and the pointed end is toward the bottom of the container. These eggs are still fresh enough to use in cooking and are the ones that peel easily when hard-boiled. Egg beginning to tilt–almost ready to hard boil! And there you have it—use those older eggs for deviled eggs, the fresh ones for breakfast plates, and the old ones for—hmmm—can you think of a good use for a rotten egg? If I have a few bad eggs, I will dig a hole, place the old egg in it, slightly Crack it and cover it up with soil. So far, these eggs make pretty good fertilizer. Can anyone tell me if this practice is bad or dangerous? I can’think of any reason but you may know of something that I may be unaware of. I recycle the old and rotten eggs by hard boiling put in old blender grind the hard boiled eggs, shells an all add water if need be, watch chickens go to town eating what you dump on plate. I would also like to mention, your timing on this was wonderful, I had just posted a question on BYC asking if it was the floaters we should be throwing out, but I REALLY like the idea of using the old eggs as bait, in a live trap, THAT was incredible info, thank you. I will add a vote for this too. I forgot why I had labeled Community Chickens as “go straight to my junk file” until I saw this and opened it, then about two minutes later, the computer was screaming at me, and to make it worse, I already saw and listened to this same video several times. Although we all know, what we say will NOT effect what you do on your site, it’s all about money, now, right? Please tell your web designers to discontinue the auto launching of videos on you web pages!! This is extremely irritating and potentially embarrassing if one happens to be in a public area when opening the page. This happened to me when I landed on this page and it was not a quick thing to find where the video was to be able to pause/stop it (in the lower right corner of the page, below comments and ads!). This makes me leery of visiting any Community Chickens web page. If I want to view a video, I’ll launch it myself. Yes, it is very irritating, especially when you can’t find the video to turn it off? 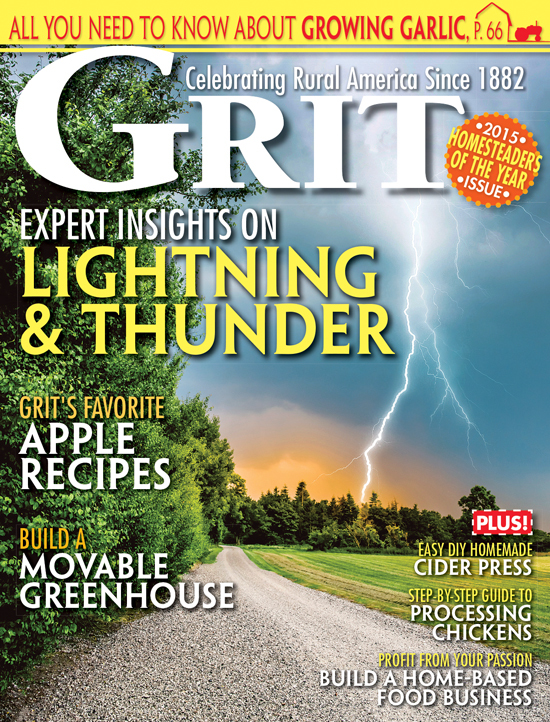 I prefer to read about what I am interested in rather than viewing a video because of my hearing! I will third that. It certainly doesnt help that the video is wayyy down on the page and takes several long seconds to find. It really kills my enjoyment of the article. I agree…..please, no auto launching videos – and no mouse roll over pop-ups. If I want a video or an advertisement I’ll click on it myself. Thank you. The video does not auto launch on my machine, so I would chance a guess that it is your own settings. I feed the older eggs to my feeder pigs. They will eat anything. I found a nest in the bushes with five bleached out eggs one of my hens had been sneaking out to. They had to have been pretty old because they were so light weight. Put them in a plastic bag and one broke as I was taking to the garbage can. Wow! I’ve never smelled anything so bad. It made the yard smell even through the bag and the covered garbage can. Rank! You use the whole egg, in the shell? I use rotten eggs as bait in the live traps I keep set around the outside of my chicken coop. The raccoons, possums, and mink that are heading to the coop for dinner are distracted by the eggs sitting there waiting for them. They go into the trap to eat the eggs and I can then transport them (after they get a bad case of lead poisoning) to a new location far away from my hens.